When ponds are filled with fresh water, bacteria is rarely found. 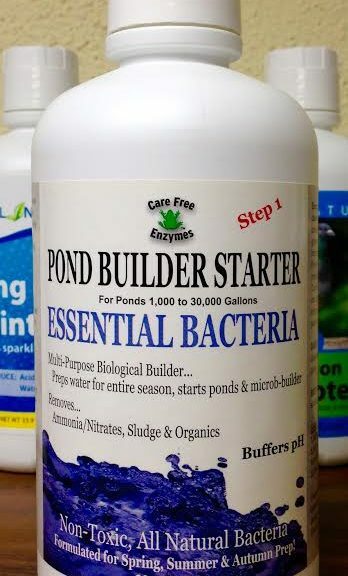 Pond Builder Starter is a mix of indigenous bacteria, which will seed the bio filter. Our product will kick-start the bacteria, resulting in a faster break down of contaminants. Do you have green and/or cloudy Water? This condition may be the result of poor bacteria growth in the biological filter. Use Pond Builder Starter to restart the biological filter. Use Pond & Fountain Protector weekly to feed nutrients into the biological filter. The condition of the pond should improve in a week or two. Should green water persist, make sure that your biological filter is of the proper size. Numerous small ponds have overpopulated fish that exceed the capacity of the filter. These factors should be taken into account when choosing a filter.